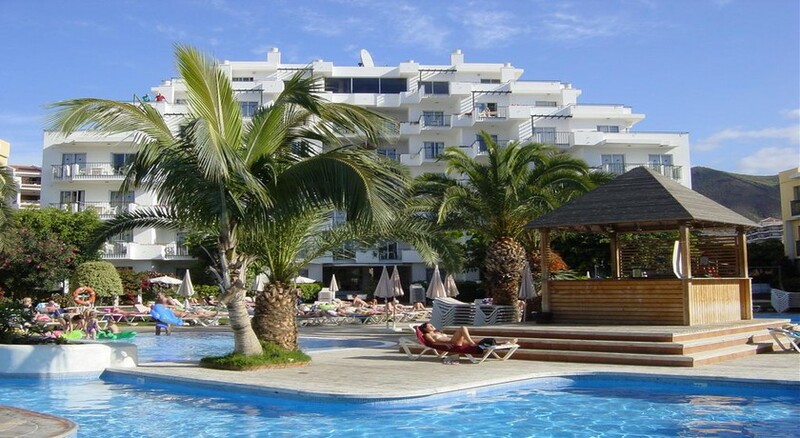 The HG Tenerife Sur Apartments is set in the bustling area of Los Cristianos and has easy access to numerous restaurants, bars and shopping centres. The hotel’s clean and comfortable design appeals to all kinds of travellers. Particularly preferred by families, this budget-friendly hotel comes with a host of on-site facilities. The apartments feature a traditional canarian architecture and come with a private terrace, a fully equipped kitchenette and private bathrooms. The rooms overlook the hotel’s lush gardens and provide views of the sea. The hotel also features two outdoor pools, a squash court, a sauna, a games room and children’s play area. There’s a golf course nearby and facilities for water sports. The Tenerife South Airport is about 15km from the property and takes about 20 minutes to reach by car. The fishing town of Los Cristianos is filled with numerous picturesque beaches. Known for its balmy weather all year round, the town attracts several thousands of tourists each year. 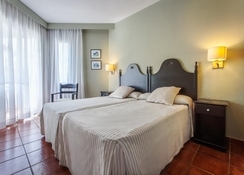 The HG Tenerife Sur Apartments is ideally nestled in southern Tenerife, Spain. It is just 10-minute walk away (1.4 km) from the Los Cristianos Beach, making it convenient for those wanting to have fun in the sun, sea and the sand. The Tenerife South Airport is about 15km from the hotel, making it convenient for the guests to board their flights on time. The hotel has wide-ranging rooms to choose from. They come in three categories: studio apartment, one-bedroom apartment and apartment suite. The studio apartment can accommodate up to two people while the one-bedroom apartment and the apartment suite can accommodate three adults and one child. All rooms come with the necessary amenities which include 24-hour wake-up call service, hair dryer, bathroom amenities, spacious wardrobes, self-service laundrette (extra charge), ceiling fan in bedroom, direct dial telephone in living room, LCD satellite TV, safe (extra charge), ADSL internet connection (extra charge), dining table with two chairs and sofa in the living room, parquet floor, terrace furniture, kettle, toaster, coffee maker, fully equipped kitchenette (cookware, oven, two burners, fridge), dining table with four chairs and sofa bed in the living room, ceiling fan in bedroom and living room and in-room service. The Hg Tenerife Sur Apartments houses a restaurant and a pool bar, where you can savour lip-smacking local and international dishes in a cosy atmosphere. After taking a swim in the outdoor pool, you can energize yourself by having refreshing alcoholic and non-alcoholic beverages at the pool bar. If you want to explore more foods, then hit the Little India Restaurant, where you will find Indian and Asian delicacies. If you are fond of Italian, European and Mediterranean dishes, then the L'italiano Trattoria is the right place to be. Both these restaurants are within a kilometre from the hotel. The hotel offers sport, fitness and leisure facilities to keep the guests engaged on their holiday. Take a dip in the outdoor swimming pool and relax on one of the sun loungers spread across the pool. Those who are enthusiastic about fitness will have a nice time in the hotel, as there is a state-of-the-art fitness centre with expert trainers. Looking for a rejuvenating session? Head over to the hotel’s spa that offers multiple massage and beauty treatments.